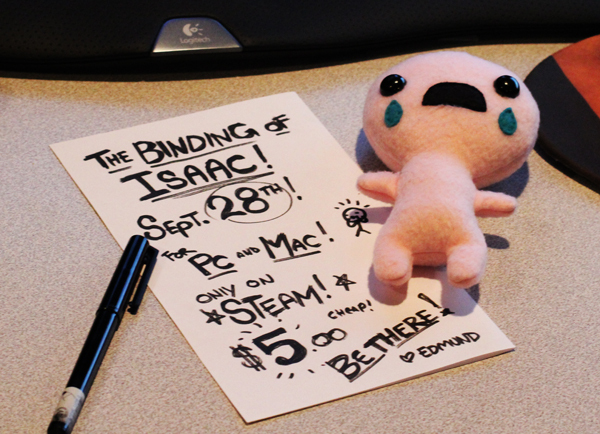 Edmund's dev blog for gay nerds: Binding of Isaac release date! Binding of Isaac release date! I love your games. At least I know I love Super Meat Boy, and I'm pretty sure I'm going to love this one. This just got me really excited. 5 dollars, does it mean 5 euro for EU ? God, Edmund, I love your handwriting so much. It shows up in some way in nearly every project you do, and it just looks fantastic. when we can pre-order the game in the EU (Germany)? there is 10 days before release no price. so we can´t pre-order it. THis looks like a ton of fun! I say get all your games together on a DISC and get them out through some means for those that don't have/want Steam accounts. Is there going to be any gamepad support for this game? Binding of Isaac out on steam NOW!! Finaly, with and W/O soundtrack.